Chandler, AZ, February 22, 2018 --(PR.com)-- American Group, a 3rd party logistics solutions provider based in Chandler, AZ has awarded their 2017 National Carrier of the Year award to UPS Freight. The award is based on a variety of performance metrics, including On Time Service, Claims Ratio, Invoicing Accuracy, Customer Service, Ease of Doing Business, and other criteria. 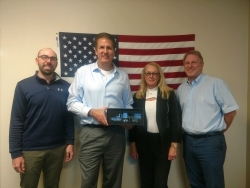 Pictured L-R: Nick Heisterkamp - Director of Carrier Relations (American Group), Dave Weida - National Accounts / 3PL Division (UPS Freight), Lynn Caldwell-Denny - Director of Sales / 3PL Management (UPS Freight), Daniel Krivickas, Jr. - President/Co-Founder (American Group).